Obwohl der Zaun nun mittlerweile an einigen Stellen steht, erhöht sich die Zahl der irregulären Grenzübertritte weiter und erreichte einen neuen Höchststand: Laut einer Mitteilung der ungarischen Polizei vom 12. 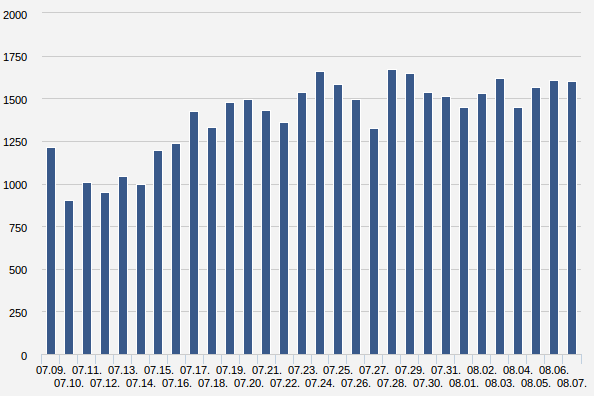 8.2015 wurden in den letzten 24 Stunden 1.783 Personen aufgegriffen. Am Zaun selbst spielen sich mittlerweile absurde Szenen ab, wie das Nachrichtenportal „444.hu.“ berichtet. 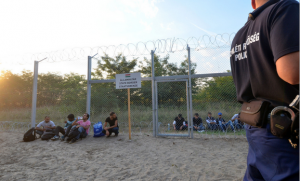 It has occurred at the already built-up fence what the analysts predicted: refugees are waiting for the authorities on the Serbian side, but already on Hungarian territory. Here they are saluting and playing some march – it was heard in the police’s radio, and it turned out that a group was stopped by the fence at Mórahalom. The refugees are sitting in front of the small door and when the police comes then they play a march, salute and ask for asylum. As they are already on Hungarian territory the police must let them in. It may be the only advantage of this situation that refugees could be fingerprinted and registered immediately at border crossing. At a press conference in Budapest on Wednesday, Minister of the Prime Minister’s Office János Lázár said that a double border barrier is needed along the entire length of the 177-kilometre-long Hungarian-Serbian border. Budapest, August 11 (MTI) – A new section of the border fence will be ready on the Hungarian-Serbian border by the end of the week. The section of the razor wire fence in Csongrad County, between Asotthalom and Tiszasziget, will be ready by the weekend, Lieutenant-Colonel Ferenc Bator, the deputy commander in charge of the construction, said in Morahalom on Tuesday. Die ungarische Polizei hat ein Balkendiagramm zu den Aufgriffen der letzten 30 Tage veröffentlicht: Die Zahlen steigen weiter und liegen gegenwärtig bei etwa 1.500 täglich. Lediglich an drei Tagen innerhalb der letzten 30 Tage wurden weniger als 1.000 Personen wegen irregulärem Grenzübertritt verhaftet. A group of asylum-seekers cut through the anti-immigration border fence under construction on Hungary’s border with Serbia near the settlement of Ásotthalom at night, according to information obtained by the state news channel M1. 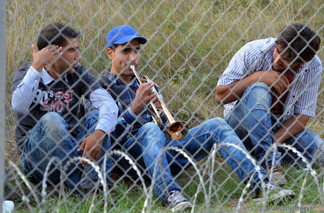 Police caught all 18 members of the group after vandalising the fence to get into Hungary […]. Material costs implied by the fence have been estimated at HUF 6.5bn, with the government deciding to allocate a further HUF 22.2bn to its construction. According to the government spokesman, around HUF 3bn will be needed for the fence itself out of the HUF 22.2bn framework, meaning that the cost of the fence will total around HUF 9.5-10bn (USD 35.7m). Die ungarische Regierung hat die Errichtung zweier neuer Flüchtlingslager bestätigt. Sowohl in bzw. bei Sormás als auch in Mártonfa sollen ab Ende August bis Mitte September Container und Zelte errichtet werden. Auf einer Anwohnerversammlungin Sormás protestierten rund 100 Menschen gegen diese Pläne, die mit der Schließung alter Aufnahmestellen in Großstädten und bewohnten Gebieten einhergehen, wie sie Orbán angeordnet hat. Regierungspolitiker schilderten, ganz im Duktus der xenophoben Angstmacherei, dass sie die „Befürchtungen der Anwohner vor gewalttätigen Übergriffen und Belästigungen“ durch entsprechende Sicherheitsmaßnahmen (Zäune, bewaffnete Lagerwachen, willkürliche Verlegungen, Verhaftungen) ausräumen wollen. Rechtsextreme Gruppen kündigten Widerstand an. The outskirts of the Baranya County village of Martonfa (population 220) is a wholly unsuitable location for a refugee camp, especially as the planned intake center has no water, electricity or any system of public utilities, reports 444.hu. At a press conference in Budapest on Wednesday, Government Spokesperson Zoltán Kovács announced that the construction of the temporary border barrier is continuing at full speed; 364 soldiers and 112 public workers are currently working in 13 teams. The Government Spokesperson said that as of Tuesday evening, 107.678 illegal immigrants had crossed the border into Hungary this year. He said that establishment of the two temporary reception centres in Martonfa (Baranya County) and Sormás (Zala County) – each to have a capacity of one thousand people – was unavoidable, but both will be located outside inhabited areas. Over 19 000 immigrants could be sent back to Hungary from Germany, Austria, France, Sweden, and the Czech Republic under the Dublin Agreements, Sándor Pintér, Hungary’s Minister of Interior, has said. Mr. Pintér said in response to an opposition question concerning the expected number of migrants to be returned to Hungary from other European Union countries that a total of 19 284 requests had been submitted to Hungary’s immigration authority, mostly from Germany and Austria. He said that since the beginning of the year, 66 788 people had applied for political refugee status in Hungary and over 43 000 of those procedures had been terminated because the applicant left the country in the meantime. The figures suggest, he said, that the migrants filed a similar application in another country, and, under the Dublin Agreements, they could be returned to Hungary. European Union member states returned 780 migrants to Hungary by July 16 this year, including 766 whose procedures had been started here. Fully 685 of them did not wait for a decision in their case but left the country shortly after filing a request, Mr. Pintér said. Die Testphase ist beendet, der tatsächliche Zaunbau hat begonnen. Einige Bilder hier.